French Talmudist of the first half of the fourteenth century; rabbi at Manosque, in the department of Basses-Alpes. He is praised as a great Talmudist by his contemporaries, although he does not seem to have written anything. He had a controversy with one of his pupils by the name of Baruch, which terminated in the excommunication of the latter. Baruch, supported by many rabbis, protested vehemently; Solomon ben Adret, however, confirmed the excommunication. Beyond this, nothing is known of Isaac. 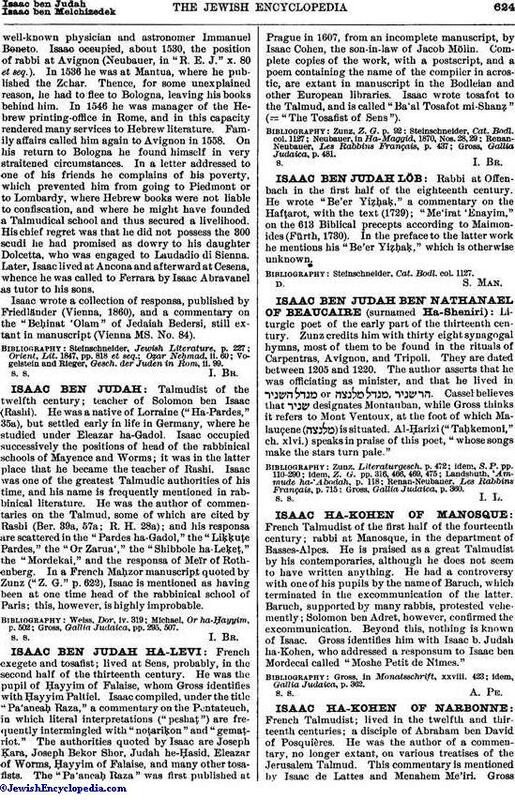 Gross identifies him with Isaac b. Judah ha-Kohen, who addressed a responsum to Isaac ben Mordecai called "Moshe Petit de Nîmes." idem, Gallia Judaica, p. 362.